So I was having lunch in Harvey Nicks Leeds with my grown-up daughter and a friend from way, way back and we were talking about the cost of buying a house and how almost impossible it is nowadays for our younger children to buy their first home, and Sian (daughter) started talking about how families should buy bigger properties together and share them. Sort of communal living but with investment. Olivia (friend) mentioned wills and what if one couple in the group split up, and we went back to concentrating on the six perfect starters we were sharing. Anyway, a few days later I saw this property and fell in love with it. I thought of being to live there with our six children/step-children and having enough space and privacy for everyone to live their own lives and raise their own families, but get to know each other better as we grew older. So, I emailed them all and told them to buy lottery tickets this weekend. Of course that failed. I felt bad about not putting this beautiful building on WOW, so here it is. If you buy it, please don't tell me. Particularly if you turn it into yet another half-empty Scottish hotel or all-for-profit care home. 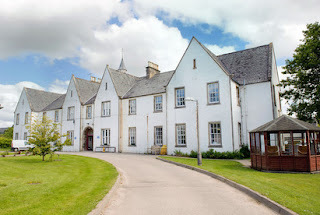 Migdale is a former hospital, built originally as a poorhouse in the 1860s and designed by Andrew Maitland. The Grade B listed property includes the big building you can see (plus a modern extension at the back) and the single-storey in the front of the picture. All sitting in around 1.85 acres of garden and land on the hillside above Bonar Bridge, with views across to the Kyle of Sutherland. It will need turning back from a hospital into whatever you've got in mind and there's no planning permission in place as yet. It's on the market at offers over £350k through Bell Ingram. More details on their site here.